On paper, Yooka-Laylee achieves everything it sets out to do. It’s fun, full of life, and a successful homage to the golden age of Nintendo 64-era 3D platformers. Essentially, it delivers the exact gameplay experience that tens of thousands of Kickstarter backers yearned for. But while Yooka-Laylee provides a worthwhile platforming adventure worthy of the classic games it takes inspiration from, its execution comes with a few hang-ups and technical issues that keep it from being the be-all end-all platforming revival that many hoped for. Yooka-Laylee is a loving homage to the cult classic Banjo-Kazooie games from the late ‘90s. Players run and jump their way through various levels, collecting “Pagies” which can be used to unlock new stages and expand existing ones, just like Banjo’s Jiggy pieces. In fact, every aspect of Banjo-Kazooie has a similar parallel in Yooka-Laylee: collectible golden quills can be used to purchase new moves; five scattered “Ghost Writers” can be found in each level, rewarding players who find them all; and character transformations can be unlocked by finding the scientist Dr. Puzz in each of the five stages. There are even quizzes that pop up to see how many little details you remember from your journey. Hugely reminiscent of Rare’s old bear-and-bird platformers, this is probably the closest we’ll ever come to getting a proper Banjo-Threeie (no, Nuts and Bolts doesn’t count). But with all of these throwbacks come some gameplay hang-ups that feel stuck in the past. Challenges feel mechanically similar to the ‘90s, but a lack of modern innovations keep Yooka-Laylee from being a rounded out experience. Why do I have to restart at the level entrance instead of a nearby checkpoint if I fall off at the height of a mountain? Why can’t I restart a timed challenge after making a mistake a few seconds in instead of sitting around waiting for the timer to deplete so I can try again? Don’t get me wrong, Yooka-Laylee has some fantastic platforming segments, but smaller quality-of-life improvements like these would keep the momentum at a satisfying pace without spoiling that nostalgic wonder. 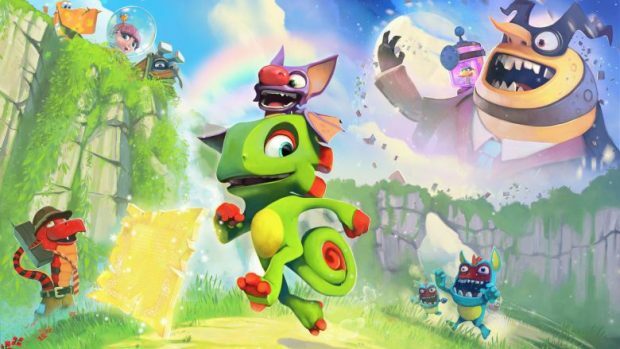 One of Yooka-Laylee’s biggest gameplay advances comes in the form of expandable levels. Aside from using Pagies to unlock new stages, you’re also given the choice of spending them on existing worlds to make them larger and unlock more content. This mechanic works great as an excuse to revisit stages to uncover new things, especially after acquiring moves unlocked in later levels. However, the downside to this means that levels will always be incomplete the first time through. Some challenges can only be partially completed, with obstacles like half-built bridges preventing players from getting an out-of-reach collectible. Expandable stages are a fun mechanic overall, just something I’d hope to see refined in a potential sequel. The controls, while serviceable, could use some refining as well. Basic platforming mechanics like jumping and attacking are handled well, but Yooka’s movement is a little too loose for my taste. The turning radius, in particular, feels too sensitive, occasionally resulting in maneuvers that are just a bit too sudden. It doesn’t outright spoil some of the otherwise well-crafted platforming sections, but Yooka-Laylee falls just shy of achieving the smooth movement that I’ve come to expect from this genre. By far the biggest gameplay hindrance, though, comes from Yooka-Laylee’s stubborn camera. The player is in full control of the camera while standing still, but turning it becomes an unwieldy beast during movement. Certain areas of the game auto-adjust the camera to a fixed position, but this is usually done at the cost of a jarring loss of camera control. Relatively simple tasks like turning corners in hallways or jumping from one floating platform to another become exercises in patience during some sections, and repeating the same challenge several times over due to a poorly calculated jump during a camera transition is extraordinarily frustrating. These camera problems usually only occur in tighter spaces, but are easily Yooka-Laylee’s biggest problem from a gameplay perspective. Yooka-Laylee unfortunately suffers from occasional technical issues too. While the visuals are bright and colorful, it’s not uncommon for the framerate to drop during some of the game’s more intense moments. Even worse than the visual stutters, though, is an issue I encountered several hours into my first playthrough: my save file had been mysteriously erased. It’s not as though the file had become corrupted – the file was just gone from my Xbox altogether and closing the app and restarting my console showed no signs of restoring it. I thankfully never ran into this bug again, but that fear of losing my progress loomed over the entirety of my next 12-14 hour playthrough. All of these setbacks aside, though, there’s still plenty to love from how charming Yooka-Laylee is. The entire experience is full of personality, and the team at Playtonic Games has a true talent in how they can bring life to even the most mundane of objects. The playful bickering of laidback chameleon Yooka and cheeky bat Laylee never grows old, and even common collectibles like butterfly health pick-ups have personality and life to them. There’s even an enemy type that is a literal pair of googly eyes that can attach itself to the closest object, bringing it to life. By far my favorite of Yooka-Laylee’s eclectic cast, though, comes from Trowzer, the sketchy move salesman who is a snake popping out of a pair of pants. This kind of tongue-in-cheek humor is littered throughout Yooka-Laylee and carries an element of fun throughout, even when some of the game’s other frustrations remain unavoidable. Much like the Banjo series before it, the soundtrack in Yooka-Laylee is fantastic. Composers Grant Kirkhope and David Wise have created some excellent tunes that capture the spirit of each stage. Every song in the game is one that I found myself whistling along to – a rarity in today’s gaming landscape. This is definitely a soundtrack that I’ll be revisiting for years to come. As a longtime fan of the Banjo-Kazooie games, I got exactly what I wanted out of Yooka-Laylee. The platforming remains mostly strong, the collectibles are plentiful, and the entire game oozes humor and charm. Despite these successes, though, outdated mechanics, loose controls and a few technical issues causes Yooka-Laylee to stumble just before reaching the finish line. For an old-school gamer like myself, there’s still loads to love from Yooka-Laylee — it just needs to smooth out its rough edges. Yooka-Laylee is a fun platformer, despite some technical issues and outdated mechanics. If platforming wasn’t your thing in the ‘90s, there’s little here to change your mind now, but fans of the genre – and the Kickstarter backers that brought it back to life – can rest assured that they’re getting exactly what they wanted.